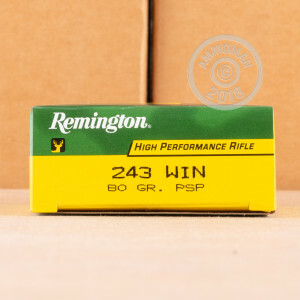 This Remington 243 Win ammunition is just what you need for your next deer hunting trip. 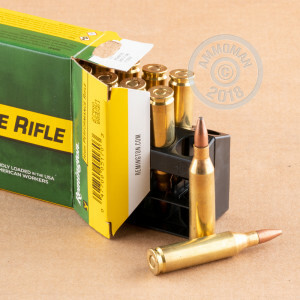 This affordable hunting ammunition has an 80 grain pointed soft point projectile, with a muzzle velocity of 3,350 feet per second. Pointed soft point (PSP) ammo has better accuracy and in-flight ballistics than regular soft point ammunition, because the sharper point cuts through the air with less resistance. This makes PSP ammo ideal for when you know the long shot is a possibility. Each round has a reloadable brass case, non-corrosive powder, a Boxer primer, and will help you bring home that buck you dreamed of. Remington has been producing reliable and affordable ammunition and firearms since the early 1800's. Generations of gun owners and hunters have relied on their products. The U.S. military has gone to Remington many times over the years for help with finding effective weapons and ammunition.